As you know little things do matter and making sure your little prince or princess has the best booster seat is essential. What they need through all the stages of their development is important to you, and I know what that’s like, so I have decided to put together some of the best baby & toddler dining chairs currently available on the market. There are loads to compare out there and finding the right one is crucial, because I know friends who have bought, what they thought was the best baby booster for getting their child sitting and eating, but in fact ended up with the wrong size both for age and weight, which is a nightmare, to say the least! There are loads of great options for dining at the table or in front of the TV, whether you prefer plastic or wood, themed or plain, push-ups or recliners there really is a multitude to sort through, so hopefully, my insight can save you the trouble and make choosing simpler. The size is crucial when choosing the right seat for your child, especially if they can’t even fit into the seat, it kinda defeats the purpose, so by choosing the right chair at the beginning with a little thought process will make for some saving, stress-free purchasing and making sure your child is safe and snug in their dining chair. A good make is important and the more sturdy the kids dining chair the better, especially if your child is a little heavier than the average. Most toddler chairs can handle rough play and a max weight capacity of 125 pounds, but of course, check out the manufacturing guidelines. The right age of child for the right sized chair seems simple enough, but you would be surprised at how many people comment on how they got the wrong feeding seat and therefore had an annoying experience explaining and return the item, which had the guidelines clearly stated on the item’s description, so as you can imagine a hassle at best. Some people like their kids dining chair to be made of a certain material and some don’t have a choice in fact as people are becoming more sensitive, whether from an ethical/environmental perspective or that they suffer from an allergic reaction also known as ‘contact dermatitis’ they must find the right chair for their kids eating needs. Some other neat chairs I’ve seen for your little ones are when they are made specifically for the child to be able to be climbed both in and out of, although this isn’t always preferred in certain circumstances it is and is a cool feature to suit some parent-child needs. Having a safety harness and an easy open a close strap can ensure your child doesn’t get freed without your permission, which might save a nasty fall. Test the tray and make sure it is easy to clip on or off, sturdy or adjustable to make feeding easy and convenient. Adjustable seat height settings make it comfortable for your child and help make use for longer. Locking wheels can reduce rocking and possible falls, but also increases the sturdiness of use, so feeding is easier. Rough edges can appear at any time and sometimes the manufacturing process goes wrong, so make sure to look at yours thoroughly. To fold or not to fold is the question and some moms prefer having a fixed chair in its place while others with less space want it tucked away after use. 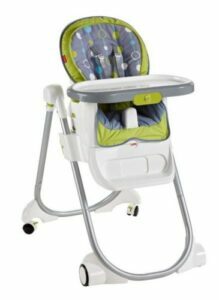 This booster dining chair is ideal for those kids that need to be strapped in and fed without having to worry too much about when seated because this secure chair ensures a solid base and good designed structure that’ll keep them king of the tower, but not necessarily too much power to topple over, which is every parent’s nightmare I presume. This toddler chair is easy to use, clean design and easy to put handle. With its slimline easy to hide design, it’s very convenient and easy to assemble and put away, which is what you want when you’re running around after one or two little rascals. This child’s dining chair has a 3 point safety harness and will not let that little mischievous whipper-snapper get out and not eat his broccoli as he promised. The weight max capacity can handle securely up to 50 lbs and has been known to also handle more, mainly because I have seen it used by an adult, but I won’t explain why here. This eating tray/table is easy to clean, which is what you want because it will be getting cleaned loads, as you can imagine, and I have seen more expensive designs that use wood, but personally I think this isn’t ideal for many reasons, mainly hygiene for me. 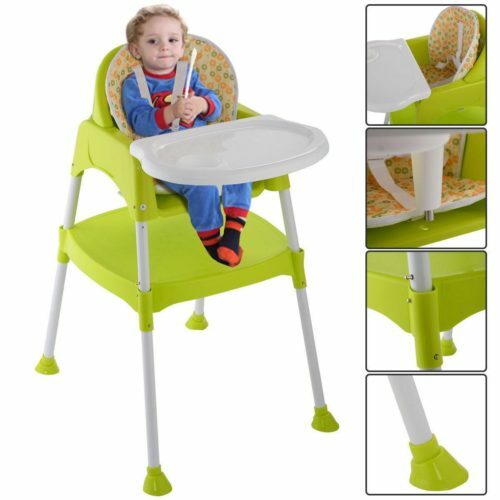 Some really good toddler booster seats for eating as the most simple in design and make eating a pleasure for all those concerned. This large tray will give plenty of room for the child who likes to get all his food on his tray before in his mouth. This feeding companion will be a favorite for you and your child, they will feel like the ‘king of the castle’ sitting upon their throne watching over his lands with glee and happiness. Ok, that might of been a stretch too far, but this is a great chair and is well known in the parenting world. This seated dining chair is almost all dishwasher compatible and can ensure the highest hygiene standards are maintained throughout all the years of use. The design limits the chance of food getting into the joints and stitching, which can make a perfect breeding ground for bacteria to fester and mold spores to linger. An example of the efforts they have gone to get the right design for your parenting cleaning demands can be seen with the rubber straps, which replaced the old harness ones. This makes things way easier to clean and is more health conscious! This neat 4-in-1 baby high chair means you can adapt it for multiple purposes, but the main one is the booster seat has an awesome feature and can be an all-in-1 device for your child’s activities. This toddler booster chair can easily be stored away for when the feeding demands are dealt with and your child no longer requires a seat. Some people have less space than would like and make sure your chair is mobile both in the home and out. This one has a remarkable design, it can become a feeding booster seat and adjusts to your child’s needs as they grow and develop through all their stages as a toddler. There is a total of 9 varying positions and has a vast range of positions to maintain height and size. 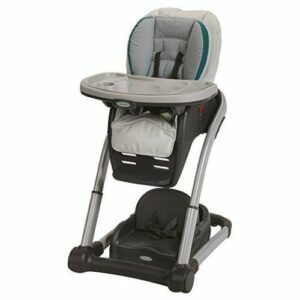 The 6 height positions assist with those growth spurts and the 3 reclining adjustable levels help to feed and make things super-easy. This dining chair for kids means it can have the tray on or off, padding off or on and can age vary from 6 months up until 3 years old, which is a huge age range comparing to some others products. The design is easy to clean with a removable dishwasher tray and cleaning has never been easier. The easy pull-out clean clip makes unwanted germ build-up less likely, which will keep your baby safe and sound. 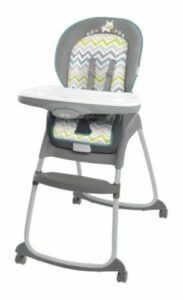 This modern and innovative adjustable toddler chair is great for dinner times and will be their companion for a good few years, especially with the 3-in-1 adjustable feature. 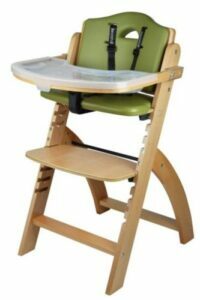 This is designed for seating and eating, which rhythms, funnily enough, allowing the natural growth of your child not to impact the use of this chair. I specifically chose this child’s chair for the easy to use, clean and sturdy design, which is similar to the last but is easier in terms of cleaning, which even can be washed in a dishwasher, which is as convenient as it comes some might say. The rolling wheels is another nice feature, feeding couldn’t be easier, especially if mom and dad are taking turns at feeding around the dinner table. Then once all this is done why not roll it over to the washing machine area and dismantle the washable seat parts to get it ready for tomorrow’s feeding. The young ones can grow up until they reach 50 pounds and even then I have seen some go beyond that, but be warned it’s not advised to. This is a little more expensive than other previously reviewed here and although not at the top-end it is still a good dining chair for children and will last the test of time, even until the next one pops along. This wooden highchair is a lovely design and the only one that isn’t mainly plastic, which for certain parents will be a Godsend, especially if they can’t entertain with certain plastics. This chair also went through vigorous testing and ensures hygienic standards that a parent can feel confident about. They use for this a high-pressure sterilization process and ensures there is not any bacteria, which at 248 °F you’d hope so. This is a high-end chair and offers a quality that some others don’t have, its attention to detail and warranty guarantee’s the best and options like this are for children that need an additional level of care. This chair has a restraining system that works in a dual-fashion and can be adjusted to various settings to keep the child secure and also comfortable. These options are 5-point or 3-point harness and your sure it’ll keep him safe at dinner time, even if he is trying to out of the seat. Cleaning couldn’t be easier with this chair, simply because the removable tray can slip off an put into the dishwasher in flash. The other option is the traditional wipe and wash, it sometimes just needs that and with this, it will be that easy. Some parents want booster chairs for toddlers at the table and for good reason, it helps the family come together and have a focus at dinner, which helps with family bonding and interpersonal development. This chair being wooden will suit a lot of family homes and fit in nicely without standing out like a sore thumb as they say. The best chair in my humble view is the “Graco Blossom Seating Convertible”, which offers an amazing value, top quality and a stylishly adjustable seating experience for both you and you kid. The 9 settings on the adjustable seating is a great feature and allow you to get the most out of this chair, both in the short term and in the future, which I feel should be the standard when decision-making time comes. The rolling wheel feature is awesome and makes for an easy setup for any eating occasion, so hopefully, the ‘terrible 2’s’ aren’t so bad as they can be for some. 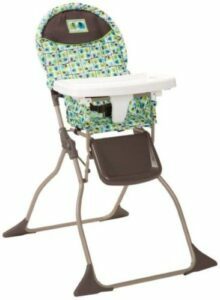 This “Ingenuity Ridgedale for Children” dining high chair comes in at the low-end of the budget for your kid and is great value for money and gives you a good bang for the buck, it has all the solid basis for being a great booster feeding seat but doesn’t break the bank. This is a lot cheaper than the other two kids dining chairs reviewed, but if you wanna spend less then the choice is simple to get this and make the most of it, because this is a fantastic way to get your kid part of the dinner table and you’ll never be disappointed with the price. Some parents and especially mothers have a debate about which of these 2 similar options are best? This is a highly contested topic and this review will not fully get to the bottom of this debate, because everyone has their own strong opinion, especially if you have had several children of you own, however, there are some noticeable key differences and some here will be explored. Some moms say toddler booster seat eating is easy and more functional if they want to visit friends or family, because of the mobility aspect, but in fact, I find separating them can be easier for long-term use. 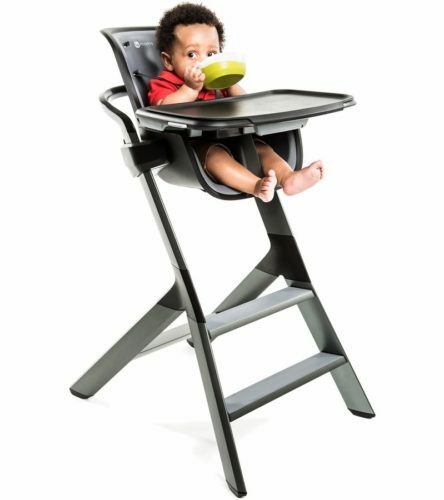 This will come down to some simple principles if you want a mobile chair device that can fit into small places and carried around then a booster is ideal, but if you want some stability and one at home all the time then go for a high chair. Personally, I don’t like booster seats for dining table purposes and feel a high chair is best suited for my child’s use, but some prefer having the portable booster seat option, which can suit a lot of family homes too. There are loads of to choose from and you will find this review simplifies the complexity. Some like a particular style, function and easy to clean features, but whatever you chose there is an option to suit everyone.